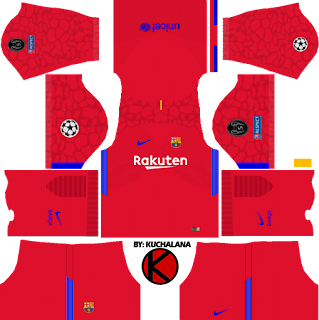 The shirt, which will feature all the benefits of the new Nike Vapor template, features a blue base with garnet fringes that radiate from the center of the garment to both sides. The neck includes the Senyera, flag of Catalonia. The version of player will have the words "Força" and "Barça" inside the cuffs of the sleeves, as it happened last season with excerpts of the anthem of the club. 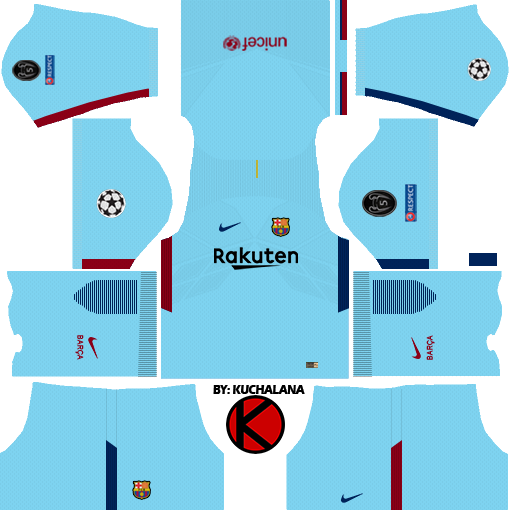 One of the main novelties is the presence of Rakuten, the club's new front sponsor. The uniform is completed with shorts and blue stockings with touches of red and yellow. The set that will look Barca away kits is very simple in appearance, appearing in blue with touches in blue and red. The shirt that the players will wear uses the Nike Aeroswift template for this season in their most important teams. The shirt is completely in blue with the only details in blue and red on revealing ribbons on the sides and neck, in addition to the Senyera, the Catalan flag, on the upper back. The pants and stockings follow the same colors as the shirt, with blue and red details. * Update : Barcelona kits for UEFA Champions League 2017/18. 80 Komen untuk "Barcelona Nike Kits 2017/2018 - Dream League Soccer"
The second kit for FC Barcelona has been confirmed. The color is blue. Can U please update. . .
Porque no sale la equipación tercera? Where is the goalkeeper kits? How you can download it in good quality? 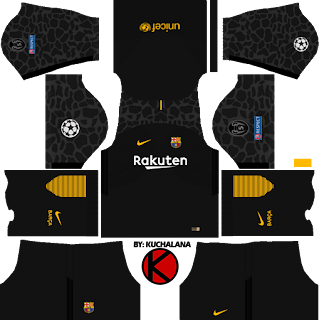 Can you remove nike logo from shirt ? It looks awakward in game as Number and logo appears together . You need to update new version of DLS2017..because they has remove the front number. One thing, can you give de URL of the goalkeeper' s kits because i cannot seen the kits and the url. El tercer kit de arquero es el que uso cillessen contra la Juventus el 22/07/2017. 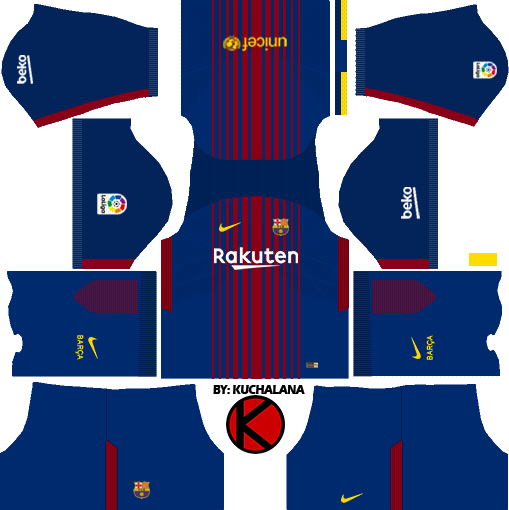 Can you please make the Nike swoosh, Fc Barcelona logo, and La Liga logo more bigger on the jerseys?? If U could, that would be fantastic. . .
Y el kit amarillo de portero? The Away goalkeeper Kit isn't black.. It's yellow. Form number 3 of the goalkeeper's form must be yellow. Are you arranging? The rakuten logo of the 3rd displacement form should be white. Please correct? You have incorrectly set the 3rd goalkeeper's number. It should be yellow, not white. 2nd goalkeeper's form should be yellow, not white. 3rd displacement form must be white with the wrong rakuten logo. There is no la liga logo on the 3rd form, would you please? 3. There should be no lines in the arms of the formane. Bro u are Brilliant.i always look to your site. One suggestion, the Home gk kit for barcelona. The orange one has yellow number fonts .So edit it. Every time I try to download the kit or logo on to my dream league then it doesn't work. 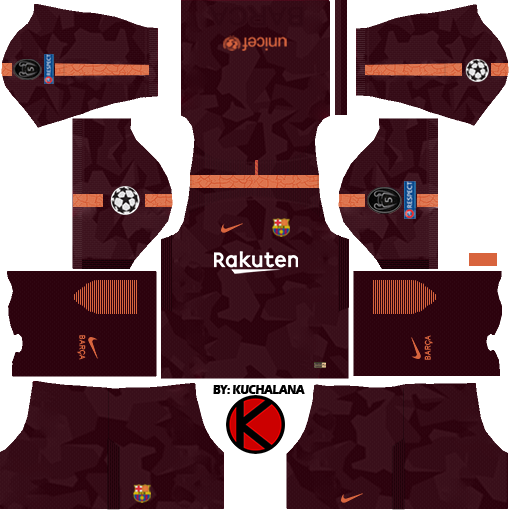 Wait a sec..where is the barcelona ucl home kit url????? the form number of the first goalkeeper form must be yellow. Not white please please !!!!!! the form number of the first goalkeeper form must be yellow. Not white please please please!!!!!!! Thanks, the Latest DLS 18 Kits works.